In 1890, The Snake's Pass was published in serialized form in the periodical The People. It is the story of Arthur Severn, an Englishman who has inherited wealth and a title through an aunt who took him under her wing to the exclusion of closer relations. His inheritance includes land in Ireland, and now that he is a man of leisure, he decides to tour the west of Ireland. As Bram Stoker's first full-length novel, The Snake's Pass is a heady blend of romance, travel narrative, adventure tale, folk tradition, and national tale. This early novel shows that, long before Dracula, Stoker used the genre of the novel to engage with questions of identity, gender, ethnic stereotype, and imperialism. 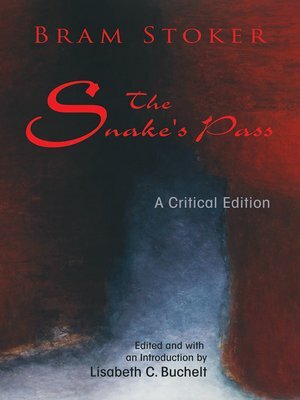 In this critical edition, Buchelt offers detailed and studied insight into both the novel and Stoker's life, demonstrating the significance of The Snake's Pass within the canon of late Victorian literature. The supplementary textual notes, scholarly material, and critical responses enhance the novel without distracting from the text. Readers will find a complexly layered and nuanced work that presents a pointed critique of British cultural attitudes and political positions concerning the Irish and Ireland.